Completion of Construction by CEU - 20 November 1963. CADIN Programme - 18 November 1963. CADIN Programme - 1 November 1963. Gap Filler Inspections - 31 July 1963. Forestry Towers & Access Roads - 11 July 1963. 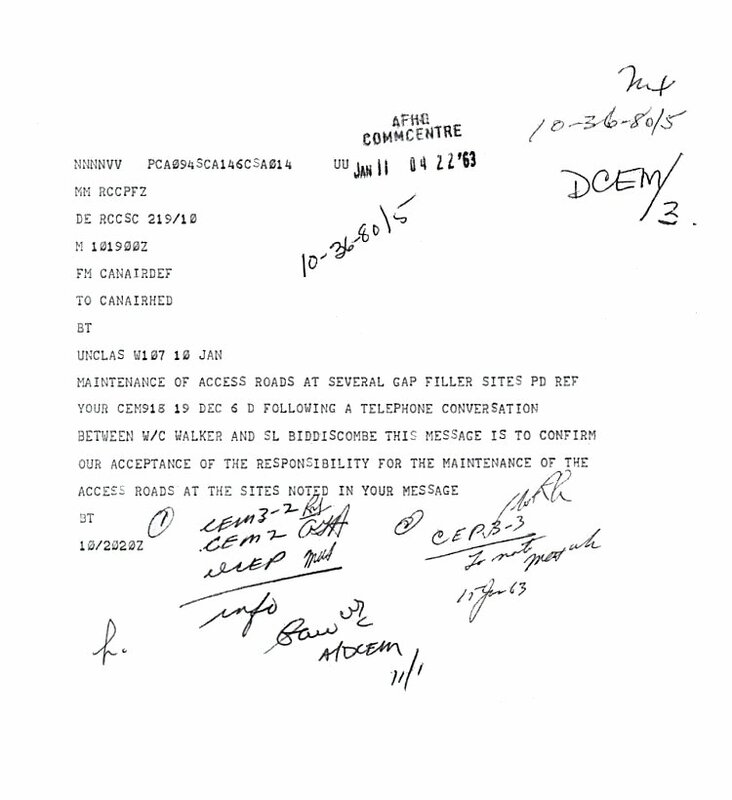 Authorization of Primary 81 Funds for Emergency Work - 9 July 1963. Requirements for Farm Type Gate - 2 July 1963. Gap Filler Access Roads - 28 June 1963. Progress Chart - 24 June 1963. Requirements for Farm Type Gate - 24 June 1963. Inspections, Care & Custody: Gap Filler Sites - 11 June 1963. Care & Custody: Gap Filler Sites - 11 June 1963. Care & Custody: Gap Filler Radar Stations - 4 June 1963. Electrical Energy: St. Adalbert, Quebec - 22 May 1963. Electrical Energy: Nicolet, Quebec - 22 May 1963. Electrical Energy: Squatteck, Quebec - 22 May 1963. Termination of Contracts - 17 May 1963. Utilities: Gap Filler Radar Stations - 16 May 1963. Care & Custody: Gap Filler Radar Stations - 14 May 1963. Gap Filler Radar Stations: Lakehead Area - 14 May 1963. Care & Custody - 14 May 1963. Foresty Towers & Access Roads - 13 May 1963. Foresty Towers & Access Roads: Deferred Gap Filler Programme - 9 May 1963. Forestry Towrs & Access Roads: Gap Filler Radar Stations - 8 May 1963. 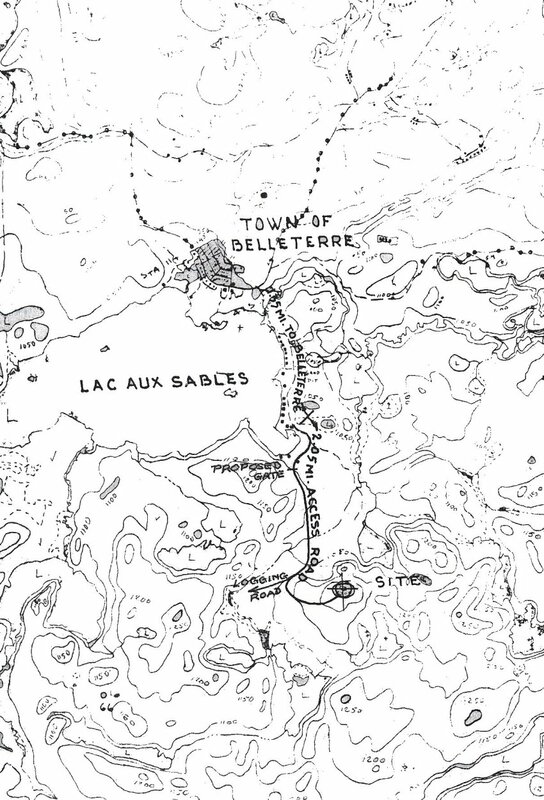 Map of Belleterre and the local area - 8 May 1963. Care & Custody: Gap Filler Radar Stations - 6 May 1963. Foresty Towers & Access Roads - 29 April 1963. Building Keys - 28 April 1963. 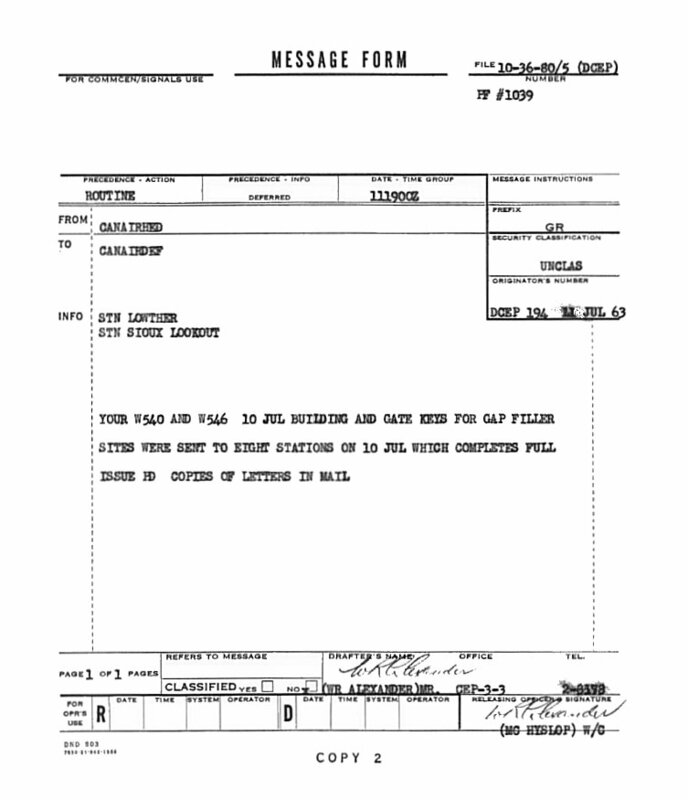 Gap Filler Radar Keys - 18 April 1963. Access Roads - 16 April 1963. Construction of Access Road - 10 April 1963. Gap Fillers: Scotch Settlement, Bridgetown, Summerville Centre - 5 April 1963. Utilities: Gap Filler Radar Site Taschereau - 4 April 1963. Utilities Policy: Gap Filler Programme - 4 April 1963. Utilities: Gap Filler Radar Stations - 3 April 1963. Building Keys: Gap Filler Radar Stations - 28 March 1963. 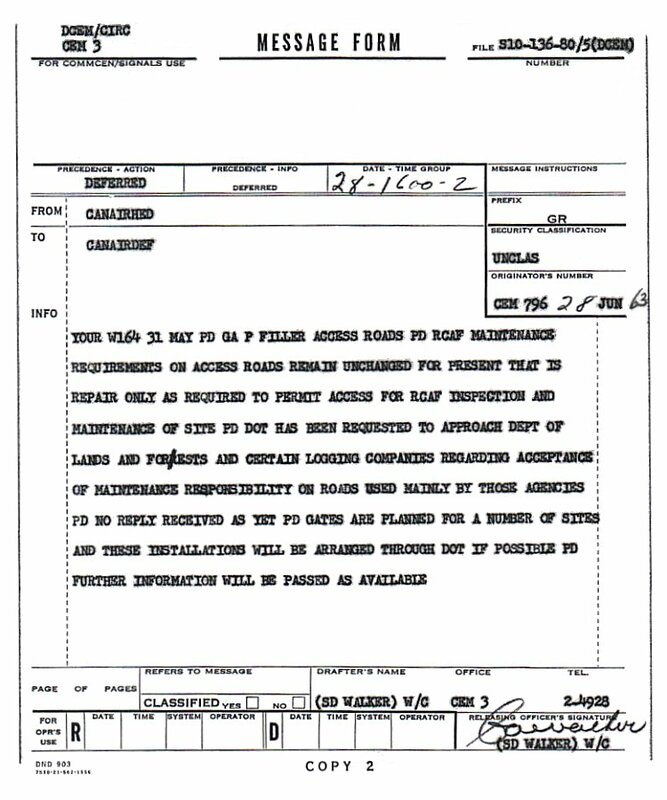 Termination of Contracts: Gap Filler Radar Stations - 15 March 1963. Forestry Towers & Access Roads: Deferred Gap Filler Programme - 15 March 1963. Care & Custody: Gap Filler Radar Stations - 13 March 1963. Forestry Towers & Access Roads: Gap Filler Stations Eastern Canada - 12 March 1963. Acquisition of Property: Gap Filler Sites - 12 March 1963. Gap Filler Programme: Construction Status - 12 March 1963. Diesel Alernator Sets & Assorted Equipment: Gap Filler Radar Stations - 6 March 1963. Care & Custody of Buildings and Maintenance of Access Roads: Gap Filler Radar Stations - 6 March 1963. Tracked Vehicle: Gap Filler Radar Stations - 6 March 1963. Commercial Electric Power: Gap Filler Radar Stations - 6 March 1963. Land Acquisition & Forestry Towers: Gap Fille Radar Stations - 6 March 1963. P&S Target Dates: Gap Giller Radar Stations - 25 February 1963. Construction Status of Gap Filler Programme - 20 February 1963. 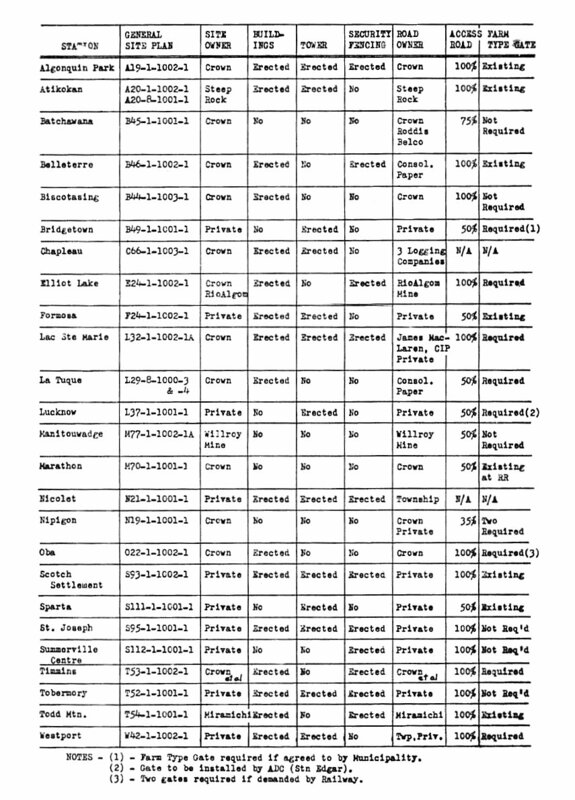 Gap Filler Programme: Status of Construction Contracts - 20 February 1963. Summary of Gap Filler Radar Stations - 15 February 1963. 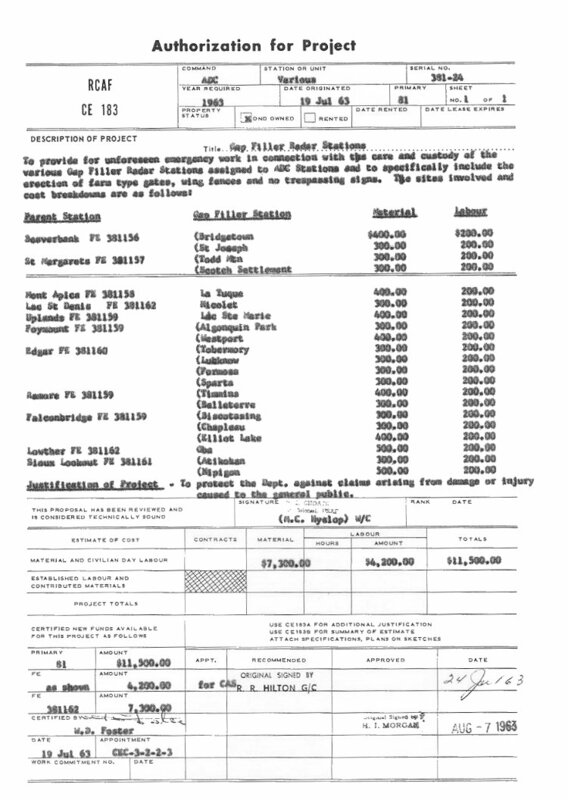 Gap Filler Programs: Status of Construction Contracts - 15 February 1963. 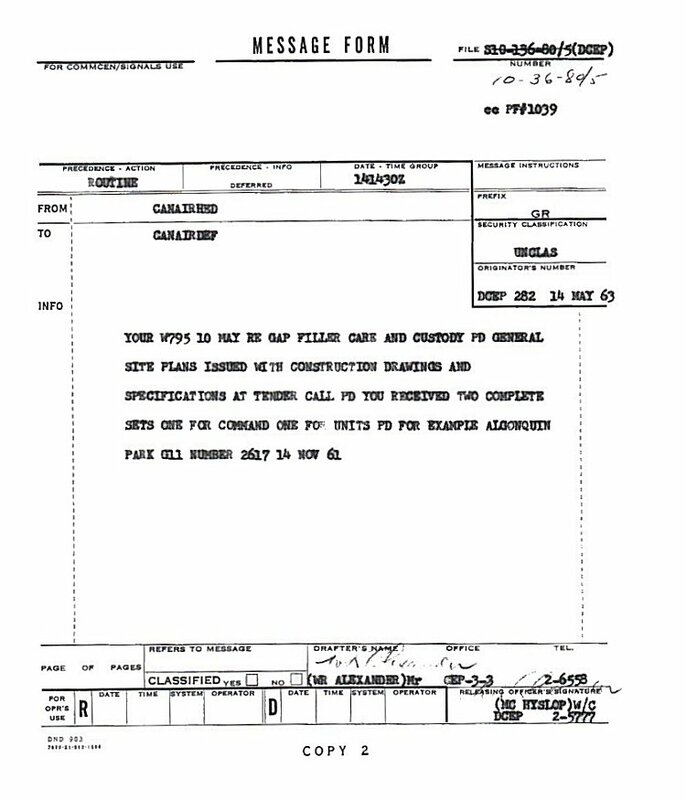 Gap Filler Radar Programs: Construction Contracts - 15 February 1963. Acquisition of Property: Gap Filler Programme - 15 February 1963. Property Requirements: Gap Filler Programme - 15 February 1963. 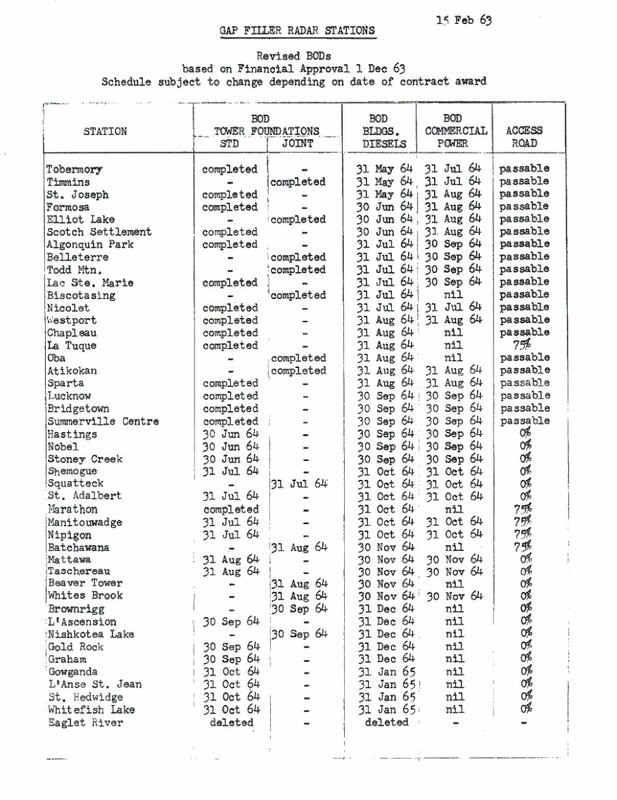 Schedule of Construction: Gap Filler Radar Stations - 8 February 1963. 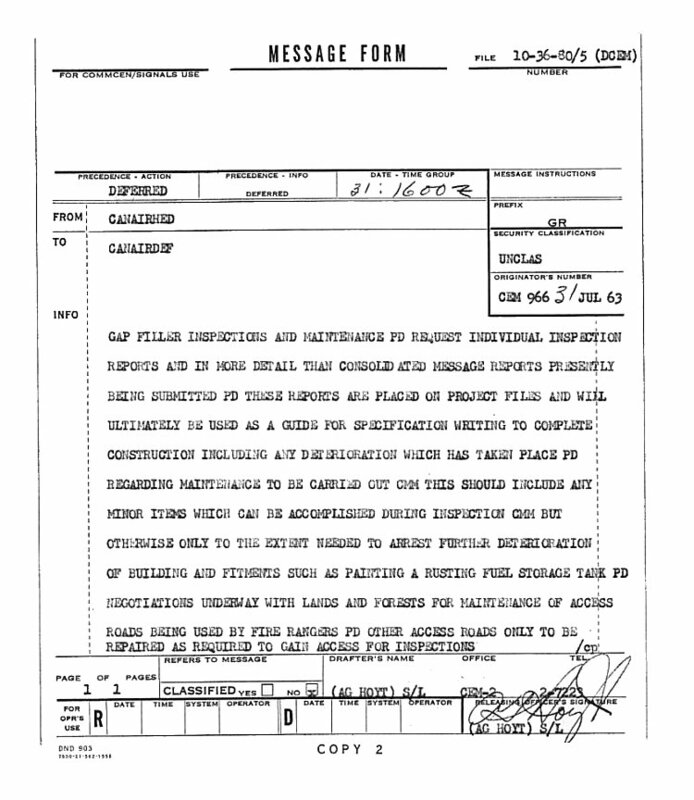 Gap Filler Programs: Construction Status - 1 February 1963. Gap Filler Minute Sheet - 31 January 1963. Status of Construction Contracts - 15 January 1963. Outstanding Work at Gap Filler Radar Sites - 15 January 1963. Maintenance for Access Roads - 11 January 1963. Issue of Plans & Specifications: Gap Filler Radar Stations - 9 January 1963. 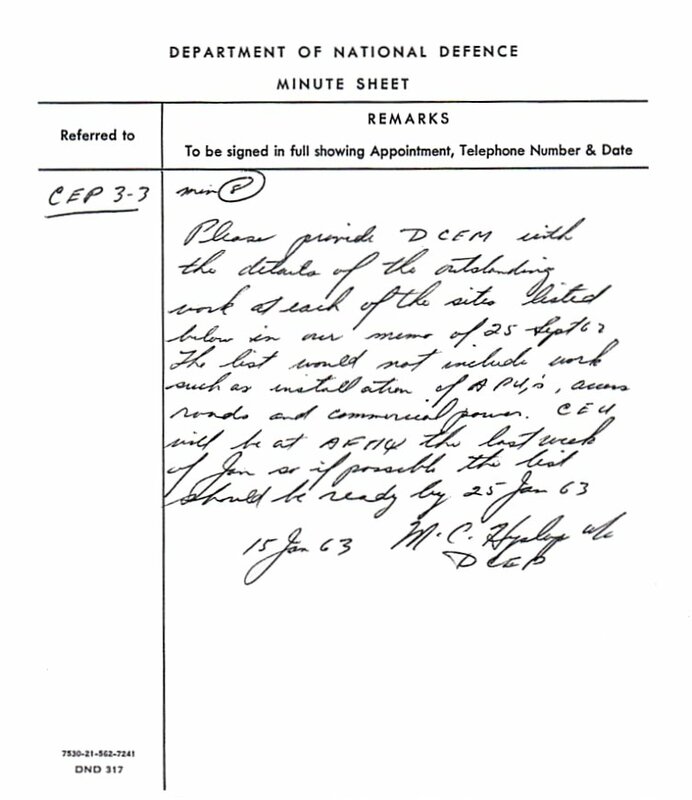 Renegotiation of Contracts: Gap Filler Radar Stations - 9 January 1963. Completion of Construction: Gap Filler Radar Stations - 8 January 1963. Draft Secifications for Access Road - 3 January 1963.